Description/Image: A particularly large Neopteron monster. It has powerful mandibles capable of crushing stone. An aggressive monster it can grab and throw hunters long distances to keep them from invading it's territory. It's a pearlescant black color, giving of different hues when light strikes it in different ways. It is known to roll balls of dung to use as a "nest" for Hornetaurs to hatch from. As such Somataur are believed to be the leaders of said Hornetaurs. Weakness: Fire, Poison on exposed abdomen. Weakest point is its exposed abdomen. Attacks/Tactics: Succeptable to Shock Traps only. Can regurgitate Conga dung on hunters. Can beat it's wings to produce sonic effects(works like a monster's roar). Can do a short flight in a straight line, releasing sleep gas, this is a rare attack. It mainly attacks with its mandibles. It prefers to fight from the ground but will take flight to flee from hunters when it is critically damaged. If its shell is damaged it stops flying and will throw hunters from the area the the Somataur inhabits. If you damage it's legs it will roll over on it's back like a turtle, exposing it's abdomen. Carve List: Mandibles can be damaged(causes weakened attacks), shell can be broken, exposing its abdomen. It looks good but one question: are we doing carve rates, or are admins gonna be rewarding weapons and armor instead? I didn't know so I went ahead and added them. I think we could implement a system of carves, make it more like real MH. But that would be so tedious. Progression would be the same, if not faster since there are humans controlling it and we tend to let some things slide. 3 wings on a gypceros WTF! also on this example: wouldn't the hunter target said wings? 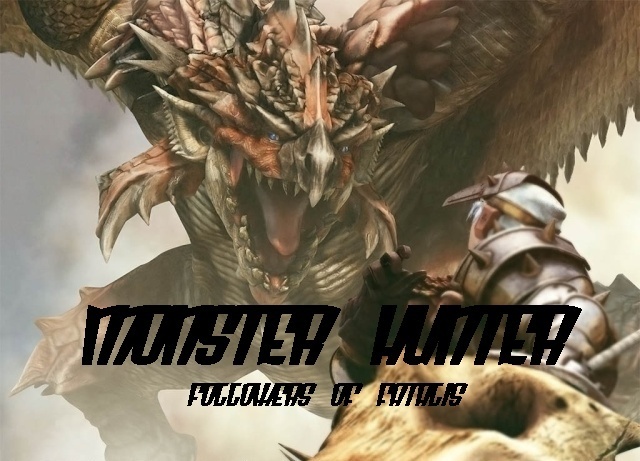 I am just trying to be more realistic thats all... as you saw in the unite opening, the hunter brought a rathalos back to town VIA large wagon. couldn't the same principle be applied here? one last thing, do you want me to add the monsters exclusive only in MH Orage here? I suppose we can do it that way. I just figured we'd make it more like actual monster hunter as far as that went. We could use capturing that way, just make it a lot harder to capture a moster than to kill it, make it involve careful planning, preparation, patience, and pulling your punches a little. so what youre saying is only through capturing will you get perfect carves? I'm saying capturing gives you better materials than just killing does. Well Devin agreed with you, about making it more realistic. I was just trying to keep it true to Monster Hunter. I suppose the only real advantage to capturing would be better quality parts. I wanted to make it more realistic. another thing that I wanted to improve was the monsters AI. and we did that by making a profile for them. this way we can make new moves for the monsters. First we don't need carve rates unless whatever we cut off magically disappears. Next on carves... We can make a part unusable if we say blew it up. Even then an exploded body part has its uses. Also besides the carves this seems acceptable.